Mickey Traub submitted this photo and caption. These people are the DCI age-outs from the NorthCoast Academy Percussion Ensemble. This family of friends has been to Europe together and two of them are even dating. All of these people took the field on Finals night for the last time in 2009. Four of the six will not be returning to NorthCoast this year so Finals night, in a sense, was their last performance together. 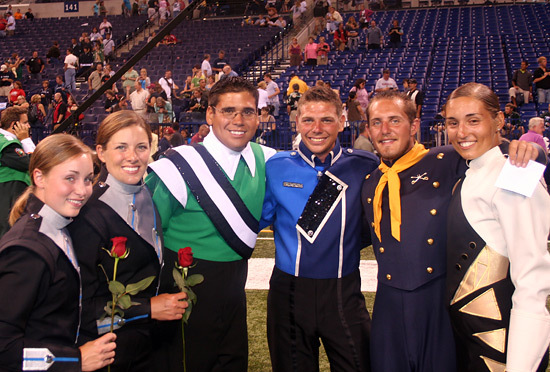 Left to right: Danielle Clarke (Legends), Ashley McNees (Legends), Oliver Rodriguez (Cavaliers), Erik Kosman (Bluecoats), Mickey Traub (Troopers), Denise Martaus (Glassmen).